DeluxeMoon: A Comprehensive iPod Touch Application on Lunar Astrology. It is often believed that the moon greatly influences the tidal conditions of the ocean, he outcome of our destinies, and even the totality of our mood swings. If you are one of the very strong believers in lunar astrology, then Deluxe Moon is the ipod touch application for you. Lifeware Solutions is the developer of this application. What’s this DeluxeMoon All About? Deluxe Moon is a bit confusing in the beginning. It has a whole lot of information on the opening screen but is able to deliver everything with elegance. When you tap at the screen, it gives you a bunch of information like the moon compass, zodiacs, moon phase calendar, and many more. 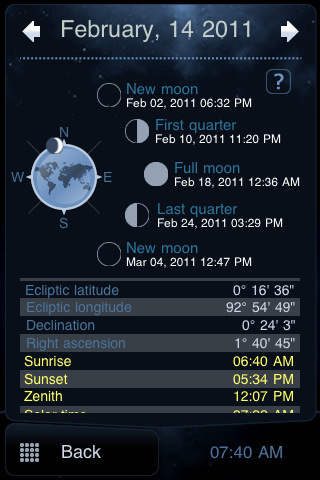 DeluxeMoon App for iPhone, iPod touch and iPad really gives you very vast collection of information through effective exploration. You could just turn the moon and drag it to change dates; you could get access to the next phase of the moon; you could get the azimuths on moonrise and moonset with the moon compass; you could follow the effects that the moon gives your life; you could put notes t your calendar that includes moon phases and colors; and you could even get the full names of all the phases of the moon. If you really are very in to the moon and lunar astrology per se, this DeluxeMoon is the perfect application to go about. With all the information that you could access in this application, you could easily be the moon guru. It really makes a difference of you know where to look in this application. There can be quite an overload of information if you think about it, but if you really want to know about these, then it is basically all right. This is the hub of all that you have been looking for in lunar astrology. Deluxe Moon just has to be at the top of your lost. It is a huge treasure chest of Lunar data just waiting to be tapped. It is an attractive and stable even for the first-time users of the application. It provides you a fast access to your kind of information—Moon information. It would probably take you longer to look for the date that you want in a regular search engine. Even of you are not a moon enthusiast, this would probably be something refreshing for you to try. Deluxe Moon is very informative and very useful if you want to impress your friends. The moon is one of the oldest fascinations of man so if you can get access to everything about it, it would be really awesome!